We Ethiopians carry the burden and brunt of Tigray liberators merciless oppression and persecution for so long. Without changing a single political and social views and policies that it brought from the jungle in 1991, the TPLF regime has continued to be the hegemon and belligerent force in the Ethiopian political landscape. With no sign of real change and reform beyond GIGO cycle, garbage in-garbage out cycle, they conduct every five years and dare to call ‘election’ we see no effort and will to change any policy and political position by the Tigray Liberation led regime in the last quarter of a century. As a result we bear the pains of exile, persecution, mental and physical harassment and inhuman treatment. If we fail to create the wherewithal to bring change to our nation and home that no other place substitute, it is not because of TPLF’s strength and invincibility. But it is only because of the oppositions’ division and lack of common vision. Although others can assist our cause, the quintessential factor to advance freedom, equality, justice and economic change in Ethiopia, conviction and clarity of purpose is all that is needed from the forces of freedom and liberty. Yes, we have to believe that we are the ones we are waiting for! In its quarter of a century grip on power a government that continue to beg international food assistance to feed the millions of people it cared less and while others suffer under untold social and economic malaises that make them leave their homeland under dangerous and inhuman conditions should not be given let alone another five years term but one more day. It does not matter whether the West and the rest get this in their head or not. What matters most is whether it gets in our head and if we are willing and able to commit ourselves to take the highway to get our country back and establish a new beginning by bridging the gaps and filling the holes between different opposition groups and sub-regional actors committed to our cause. It is only then the era of misery, exile, injustice and violation of human and political rights would come to an end. It does not require telling for anyone, since it is true as the sky is blue, that in international state relations priorities of states are set in terms of how best each nation can fulfil their national interest first and foremost. It would be senseless than sensible for anyone to expect fairness and righteousness dictate any foreign nation’s actions and behaviors with regards to the situation in Ethiopia. Be it the West or East they are all guided by principles that best fulfils their private interest out of any situation in Ethiopia, or Africa in general. That is how it was yesterday, it is today and continue to be in the future. So, it would be in our best interest to stop getting excited – in anger and delight – when the West or the rest has taken certain policy decisions with regards to the TPLF regime. I assure you, when the opposition becomes strong enough in human and logistical capacity to face-off TPLF the West and others would start to listen as they never had and they will start to reconsider their policy position towards TPLF, which is guided neither by reason or principle. Without social quest for a new idea and system that incorporated above all freedom and liberty of citizens, the developed Western states that we die crossing deserts and oceans to be part of would not have been the elephants of international relations today. They became what they are not because they are white or bright. If it was not for their decision, passion, conviction and action to make their institutions work better they would have been no different to what and where most African, Latin American and Asian countries find themselves. But, when ordinary people rise up and refuse to settle to a status-quo they do extraordinary and magical things, for themselves and to the generation that will follow. As they say ‘Freedom is not free.’ To create the political, economic and legal systems that we see in the West and we are jealous of and wish to have for ourselves they have sacrificed their time, energy, material and above all lives. Most Western democracies are a result of tremendous blood shed between those who fought to keep the status-quo and the people who dared to take their own future in their own hands. The British Civil War from 1642-1659 made a precedent for the monarch to consult parliamentarians in the exercise of his power there by ending absolute monarchy. The will and sacrifice of the people of the American colonies to free themselves and be the masters of their destiny by breaking out of the grip of the British Empire has led to today’s giant of international relations- the United States of America- the global power breaker and leading economy in the world. Similarly, the 1789 French revolution; the Italian and German (re) unification wars in the second half of the 19th c. as well as many others were responsible for the unprecedented economic and political transformation that followed through the adoption of new systems and principles that governed their social, economic and political relations. The west needs Ethiopia, Africa in general, to have strong men who can avoid anarchy and chaos and do business with them in spite of their repressive and brutal treatment of their citizens. It was not long ago we heard Pres. Barack Obama calling the TPLF regime in Ethiopia ‘democratically elected’ causing an uproar from many corners. What ignited that uproar was his blunt denial of reality and clear derailment from the tracks of principled diplomacy and idealism the President himself spoke passionately about on many occasions. Had Mr. Obama repeated the very speech he made in Kenya about how ethnic and tribal politics would end up tearing a country apart to the Ethiopian audience, we would not have asked for more. I don’t think Mr. Obama is oblivious to the political reality in Ethiopia. Since he knows that Ethiopia is a ‘democracy’ he should have too known how political parties under the ‘democratic regime’ are organized and to what end. The problem is not whether the West have a clear and conclusive knowledge about the state of political reality in Ethiopia. The problem is their decisions and actions are not dictated by reason and long term national interest considerations. Rather they are driven by the degree of financial and personal influence TPLF and its corrupt business affiliates can make in the policy and law making circles of the US and Europe and the administrations. It is true Ethiopia is poor. But the donkey government that incompetent Cadres ride on is so rich they spend millions of dollars to buy sympathizer politicians who call them the tiger government led by ‘visionary’ leaders. Besides the regime itself, people who are beneficiaries from the TPLF system are too engaged in the same lobbying business on behalf of the government. Not long ago we have come to realize from Fox news investigative report that pointed out Billionaire Sheikh Mohammed Hussein Al Amoudi, the biggest financial backer and business partner of the TPLF regime, contribution of millions of dollars to the Clinton foundation in the name of the TPLF government. Some might argue that the foundation has no political influence and power since it is engaged in advancing social agendas outside of the US. However, it would be making a fool out of ourselves if we think that the Clintons have no political connection and network with the Democratic party legislators and executive members to influence them to have a favorable opinion towards the TPLF government as a result of the money they were provided. With regards to this issue it would be relevant to mention the fact that Hilary Clinton, the wife of former Pre. Bill Clinton after whom the foundation is named, has been Secretary of State for the current administration for four years while the Sheikh was pumping millions of dollars in the foundation’s account. If anyone think that this would have no effect influencing the views and judgment of the State Department towards the TPLF regime they have to think again. Compared to what is in store ahead, however, what has transpired is light as a feather. If the former Secretary of State end up being a resident of 1600 Pennsylvania Ave. in the 2016 presidential election, we all can expect that TPLF would be given a room in the basement. This reality is very telling of a fact that no matter how just and noble ones cause may be what determines the views and opinions of others is not necessarily determined on such consideration. Rather, the money factor plays a bigger role. Although it is a legal business and even norm to be engaged in lobbying, it is corruption under the law. We have seen it time and time again, the TPLF regime is well aware of what it needs to do when it comes to decimating people or parties opposed to its hegemonic status and demonic character. American lobbying business seem to go in a perfect harmony with TPLF’s behavior and nature at least in one aspect. Looking in to TPLF’s repeated political strategy it would be hard to miss the fact that when certain parties and politicians are outspoken and devoted in advocating political, civil and human rights that seems to create passion in the society they would not waste time to put a check or a chain in their hands to buy or punish them. Since most of us know by name how many people are given a room at Sheraton Addis after they were bought or how many people were sent to jail cell at Kality Prison after they refuse to be bought, we do not need to talk much to confirm the facts. It is no secret that the influence of money in politics has been a very dangerous challenge to the best and oldest system the world has ever seen, American Democracy. Let alone foreign related policies that concerns other states and people, even domestic issues and policies that concerns the American people themselves are greatly influenced by the money pumped in to the political discourse. Because of the special interest influence and control on policy makers and legislators some policies and laws are made or suppressed based not on how many people will benefit from it. It has become a norm that they are made or not made whether big money has been used to stop or pass it. Let’s see how this game is played by taking two policy areas, one national and one international. The National Rifle Association (NRA) spend millions of dollars every year to influence Congress (Senate and House) to stop the passing of a law that would limit and restrict the sale and use of some high powered assault weapons (HPAW). As a result, we hear the frequent sad news of mass murder in schools, churches, theaters and streets of the US. In the name of Second Amendment Rights ‘the right to bear arms’ the NRA and its gun crazed supporters have used their power to the last drop to stop any attempt that would affect the free sale, distribution and use of automatic weapons when and where they are neither required or needed. Nevertheless, unable to stop the lobby of the Association and even after witnessing so many horrors as a result of gun violence people can still buy HPAW from Gun Fairs or Walmart, without or with little criminal background checks and mental evaluation. To keep corporate America continue to profit from the production and sale of HPAW the NRA and others employ their big guns who would make sure that no one interferes in the business by making laws that restrict the free flow of bloods. The other area that exemplify the lobby’s money and leverage influencing policy position relates to US’s foreign policy towards the unending Israeli-Palestinian conflict. The Israeli lobby that have significant influence on members of the US Senate and House as well as the administration remains an obstacle to finding an equitable and workable solution that best reflect the values and driving principles of US foreign policy. When the Cold-War ended so does Israel’s strategic importance to America. Nevertheless, the diplomatic, political, military and financial unwavering support that has continued increasingly since would be justified only on one ground;- the lobby is in charge of the driver seat with regards to the US policy towards Israel and the Middle East. The rhetoric that every politician seem to repeat as the national anthem, ‘Israel is our ally’, seem to reflect no current reality and the billions of dollars assistance channeled to one of the richest state in the Middle East while America itself is sinking in trillions of dollars debt is inexplicable to many observers and political analysts. This puts one thing in perspective, American politician’s opinions and views towards Israel is not necessarily seen based on Israeli-American bilateral relations and the mutual benefits involved. To some degree politicians shape their views and opinions regarding Israel with the calculation of how much support (votes, finance, Media coverage, endorsements etc…) they could obtain for their Congressional and presidential election campaigns while the interest of the country is thrown in the back burner. Despite the United Nations General Assembly resolution in 1948 that declared Jerusalem to be an international city, many successive US Presidents including Barack Obama had firmly endorsed the idea that Jerusalem is the undivided city of the Jewish state. Besides, the Israelis illegal settlement homes in the Palestinian territory that same UN resolution allocated to them but annexed by Israel following the 1967 Arab-Israeli war, the silence of the US politicians is deafening. Although it would be very extreme to suggest the Israelis actions and treatment of Palestinians in the occupied territories is ‘Genocide’ and ‘Apartheid’, as former President Jimmy Carter characterized it in his book ‘Palestine: Peace not Apartheid’ to any independent and reasonable mind what has transpired in the region is a travesty of humanity. And partly, the US policy makers and administrations failure to have unbiased and impartial position in the conflict Palestinian-Israeli conflict remains to be the center and source of regional and international tensions and a breeding ground for anti-Western sentiments amongst the Arab-Islamic world. The point I wanted to make by the two examples is to give a broader view of the state of reality in the American or Western policy and decision making circles and the impact and control of special interest groups. If the lobby can influence the policy and laws made by politicians even on domestic issues anyone can just imagine what they can do on matters and policies that concerns one poor country way far in Africa called Ethiopia. So, that is why I would be obliged to reiterate the point I stated earlier about the need for taking the high way, the way that we have control over and determine the pace with no expectation from no one but us. Nevertheless, accepting and catalyzing on the opportunity afforded to work together with a neighboring country should not be excluded from the equation. Specially, when that genuine offer to work together is meant to benefit both parties, there is no reason why it should be undermined and doubted. Almost a year ago I wrote an article under the title “Isaias Afeworki, TPLF and Ethiopians” and argued the need for cooperation with the Eritrean leader since that is the most effective and feasible effort that would help to life the struggle to a higher level. My belief has even been more strengthened when most Ginbot 7 Patriotic members’ made the decision to move there and lead the effort. On the other side the defection of the implanted TPDM leader defection has more cemented my opinion of the commitment and will of Isaias and PFDJ for the cause of the opposition. Unless it is because of the opposition division and lack of unity nothing should be criticized from the side of the Eritrean regime. When the Eritrean leader and his potential positive role to the opposition’s cause is suggested some seem to take it with suspicion and doubt. Since TPLF has made a lot of experiment on us in testing its propaganda, understandably it takes a little time to clear ourselves from the clouds of hate and demonization hanging over our head. Changing times create changing friends and enemies. Especially in politics thirty days are thirty years, since a lot can happen in a very short period of time. We have seen the Libyan leader who was in power for forty years thrown out of power and dragged on the streets and killed in thirty days; we have seen the Egyptian leader who ruled for thirty two years taken off of his throne in just twenty days. Therefore, our political views and opinions with regards to certain groups and powers has to change as well based on careful and thorough evaluation and analysis of the situation. As the German unifier Otto Von Bismarck put it, ‘Politics is the Art of the Possible’ and that is why we should embrace a new mentality and new hope and focus on what we can do to solve the problem we have at hand today than what happened yesterday. As much as the Eritrean mentality and perception of Ethiopia before twenty-five years have changed, so did ours. That is why today is a new day new problems should be tackled and new hopes should be set among the two people. In all seriousness, more than what the west can do for the Ethiopian opposition, in advancing their cause for equality, freedom and liberty, what President Isaias Afeworki single handedly can do is incomparable at this stage of the struggle. 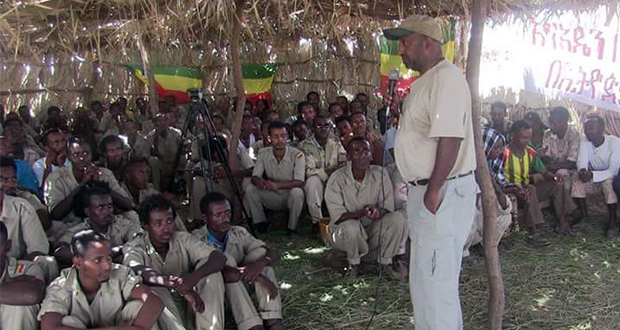 The genuine effort on the side of PFDJ (Peoples’ Front for Democracy and Justice) to support the freedom effort in Ethiopia by allowing its territory for opposition groups, providing training and logistic is the kind of support that really matters on the ground. Unless it is because we the opposition are weak and fake, the opportunity provided by the Eritrean government and people who have a common interest with the opposition in the removal of the TPLF regime does not come along often. As they say, ‘the field and the horse’ are right in front of us. The question is, do we use it lose it! Some still could not digest the idea that the Eritrean regime that is neither democratic nor tolerant would not be a genuine partner in the creation of a democratic and inclusive government in Ethiopia. The point many people seem to miss is that the struggle belongs to Ethiopians. And, what we can establish in Ethiopia on the graves of TPLF regime will be determined by Ninety million Ethiopian people than three million Eritreans. People who assert that the Eritreans support of the Ethiopian opposition is to use them as a tool to destabilize Ethiopia must have watched and heard too much Ethiopian Radio and Television programs that do not get tired of repeating that same propagation. As I pointed out to assert that the Eritreans support is meant to replace the Tigray Liberators and influence the national political discourse in Ethiopia would be an insult to ourselves. Because, such thinking and understanding are a result of underestimating one’s own strength and power and above all it comes from the position of fear and weakness. The need for cooperation with he Eritrean regime makes or break the oppositions chances of being a force to be reckoned with that have a political weight that can neither be ignored or belittled. If there is anything that would wake TPLF up in the middle of the night is the cooperation of Ethiopian opposition groups and the Eritrean government. Because, Tigray Liberators do not seem to miss the point that a multi-ethnic group that have some strength to actively function in some region in Ethiopia would be the beginning of the countdown to the TPLF regime demise. Once the Ethiopian people offered the opportunity to choose and join sides I assure you the opposition would be like the sands in the beaches. But, what is important now is making sure we can set our foot in our homeland and be able to create the opportunity for the masses to join. Victory to patriotic Ginbot 7!